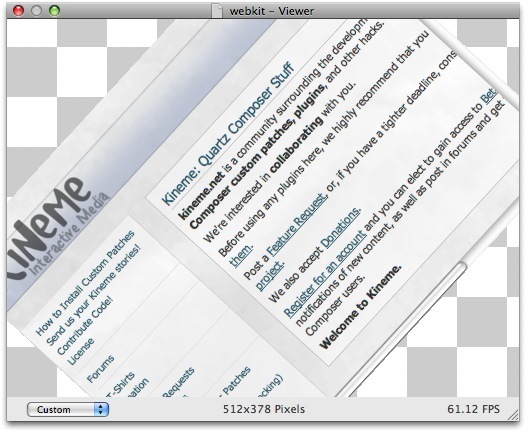 Render webpages, including flash and videos. I've commented on a Create Digital Motion post here, reporting that Flash support is gone in Quicktime / Leopard. As you can read in that post, I'd really like some form of generative code patch in QC - be it Flash, Processing, or NodeBox (as someone else suggested). Preferably an OSS solution. If Webkit can bridge both Flash and Java / Processing support and be easier to implement, I'm willing to live with having to do a dummy HTML page. If that's what it takes. As a bonus, you'd get live web pages in QC. I think this is how paparazzi does it as well (it creates a window at -16000,-16000, and renders to it, then gets an image of the window). A way to do this could be to create a real-life Safari window at -16000,-16000, as Safari includes all that functionality you wouldn't have to do yourself. Did you do that between 2 WWDC conferences ?.... :) Seems it is not photoshoped (or very clean...:) so...it's alive...? I did it mostly during the Bonjour conference (it was more boring than I was expecting, hopefully smokris picked up the important parts), and then got the image capturing working in an Open Lab. Working on some polish before release. They don't kidnap you !? Do you plan to manage input/output from a ..? html..?....swf ? This could be very efficient for GUI things....And with the features of flashplayer10...have no words...;) Processing support...? Right now, it's a really bad implementation: it renders flash through webkit, and reads the webkit output continuously. It's very cpu intensive, and definitely not the best solution. But it works for now, and that's what counts I guess. Working on adding mouse control (so you can click links, etc), and then a "keyboard output as string" patch so you can type in text fields easily. This isn't going so well though: can't quite figure out fake event forwarding to properly interact with the webkit view. Funnily enough, I was just chatting to one of the VDMX developers yesterday about this very thing. Great work guys, and hope you're having/had a good time at WWDC. ok this is anecdodic as usual...:) if not....some release today ? Is a non-interactive version useful enough for a release? Mouse/keyboard event hijacking doesn't seem to work, so it'll require way more hacking for mouse support etc. I can think of situations where I'd use this plugin, but not many where I'd need any interaction with the page view. I can see it being handy for some people though.. So how about either 2 versions (webkit view and interactive webkit?) Or just a 'disable interaction' type button in the settings, assuming it's not just a case of not forwarding mouse coords + clicks to the patch. there will only be one version of this plugin, to disable interaction you'll just not feed mouse/keyboard events. There will probably also be a persistence option (to keep the page running in the background, for flash audio etc). don't spend your time with my joke....:) There were so much releases next days that you will need to commission full time testers ! this would be very useful. will you post a beta release soon? Can we have a chance to play with ? Hi, Do you still plan a beta for this patch ? It could be great ! How much of an immediate use do you think there would be for forwarding mouse events? Would you be willing to put it out there and maybe add mouse events at a later date? Or do you mean the webkit window is hidden (or off screen) but still being shown on a billboard in QC? The window's always invisible, but then it's captured, and rendered on a billboard/wherever (it's a normal QC texture/image). WebKit can't seem to render to non-window views, and it rejects mouse events when the window isn't focused (invisible windows can't be focused, of course). I don't know if there's a way around it or not... I've not poked the source much recently (last time was around october)... lots on my plate at the moment, so this one's probably pretty far back on the list. Hi Chris, Can you release the non interactive version of this into beta? I am putting together a screensaver that will display various webpages. Currently I can convert them to PDFs and display them in QC, but it would be much better to get a live webpage in there. Much appreciated! This might be worth taking a look at. Doesn't do Flash, etc...but can be programmed to update every x seconds. How does the speech patch work?